What is The Tour Exchange? The Tour Exchange brings together travel consumers and the best travel industry providers of tours, attractions, activities, dining options and show tickets. Our friendly Travel Concierge have expertly negotiated the best Activities at the best rates so you can take back your vacation. No need to stand in line or spend hours calling around for the best deal at the best price. We’ve done all that work for you. You can stop looking and start booking! The Tour Exchange is not the operator for the Activities offered; we act solely as the intermediary between Consumer and Provider/Supplier. Prices are set by the individual Provider/Supplier. After purchase, they will confirm your booking and provide you with redemption instructions. Can I wait to purchase until I get into town? Good things come to those who wait, right? That is not always the case! We are a reservations center for all of the activities, attractions, tours and shows in Las Vegas. We receive wholesale pricing deals and due to the high demand and popularity of the Activities featured on The Tour Exchange, space is available on a first-come, first serve basis. Often times the lowest prices are available on a reservations booked in advance of travel, so instead of standing in line on your vacation and missing out on the Activity you want at the time that works in your schedule, reserve your seats early and have peace of mind in knowing your space is reserved! When you pay for your Activity, your credit card will be processed by Stripe. Payment will show on your credit card statement as Bid, LLC and the applicable Activity Provider. Bid, LLC, does not store credit card data and works with PCI compliant third party credit card processors. Payment in full is required at the time of making your booking. The Tour Exchange accepts the following credit cards: Mastercard, American Express, Visa and Discover. I keep seeing a Price Match Guarantee on many of your activities. What is it and how does it work? It is time consuming and frustrating to search several sites to find the best Activities at the best price. We value your time and your budget and therefore, instead of spending your free time researching hundreds of sites, we have done all of the leg work for you. This allows you to save both time and money, finding the right Activity at the right price. Shop with confidence and piece of mind because w hen you see our Price Match Guarantee logo on an Activity, you’re receiving an exclusive price you cannot find lower, anywhere else. Our rates are also all-inclusive, there are no extra fees at checkout. 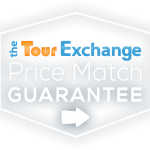 Your purchase of an Activity from The Tour Exchange, with the Price Match Guarantee logo is protected with a money back guarantee. If you do find a lower advertised rate, with all applicable fees, within 24 hours of purchase for the same Activity name, date and time with the same Provider, the Exchange will refund you the difference between your purchase price and the advertised rate. Contact our Travel Concierge to begin the process, including sending in the advertisement. If you have not yet made your purchase from us, contact our friendly Travel Concierge to inquire about price matching the Activity in which you are interested – and we may be able to meet or beat the price! (Not applicable for Activities on The Tour Exchange that may have a price change after your initial purchase or prices and Activities on Groupon, LivingSocial and Travelzoo). Do you have any coupons or other discounts available? Our friendly Travel Concierge are constantly seeking out and negotiating the best deals to be featured on our website. Unless otherwise noted, no additional discounts are available; however, on occasion we may offer online sales or coupons. To stay up to date on new offers, follow us on Facebook, Instagram and Twitter. How do I submit an SSR (special service request) for guests with disabilities? The Tour Exchange is committed to providing the most accurate description on all Activities which may include whether or not it can accommodate guests with disabilities. If you are not able to confirm this information prior to purchase, you may contact our Customer Service team at 1-844-868-7392 for further assistance. If an Activity is available for disabled accommodation, simply list your request in the Order Notes section on the checkout page. Does my purchase include transportation? Most tours and activities include round-trip transfers from your hotel; however, you will want to read the full description of the tour or activity to confirm. If transportation is included in your purchase, we recommend you contact the Provider/Supplier at least 24 hours prior to your scheduled activity to confirm your exact pick-up time and location. If your purchase does not include transportation, you may make alternate arrangements such as car rental, private transportation (Uber or Lyft, where available), or taxi service. I'm interested in a Grand Canyon tour. Do you have any that include the Hoover Dam? Generally speaking, YES! Whether you travel by Motorcoach, SUV, Trekker, Airplane or Helicopter, your Grand Canyon adventure will include the Hoover Dam. Please note that depending on the exact tour you book, you may have a “photo stop” near the Hoover Dam or you may have a tour of the Hoover Dam included. Be sure to read your full tour description. All Airplane and Helicopters will fly over the Hoover Dam, Lake Mead and the Pat Tillman-Mike O’Callaghan Memorial Bypass Bridge which connects Nevada to Arizona. I’m traveling with a group of people and we’re staying at separate hotels. How do we make sure we’re all picked-up for our tour? You may make one purchase for the entire group and simply list the additional hotel information in the Order Notes section of the checkout process. We also request you provide us with the lead traveler name and contact number of the additional group. I want to use two different credit or debit cards for my purchase. How do I split my payment? At this time the site is not able to process multiple payment methods for one Activity transaction. If you need to split your payment among a traveling group, you may contact our friendly Travel Concierge to process multiple transactions and they will ensure the reservations are all linked together. If you would like to process these on your own, just be sure to list the travel group’s information in the Order Notes to keep your group together. I want to secure the seats for my group, can I buy now and pay later? All transactions on the site are a real-time purchase. Your debit/credit card will be needed in order to secure your seats and the full purchase price is authorized at the time of booking. Please review our change and cancellation policy. When you purchase your Activity, you are committing to the Provider that you will participate and in return, they are committing to have your space reserved. If you are unable to participate, change or cancellation requests should be directed to your Activity Provider. Refer to your booking confirmation email to find their phone number. If you need assistance in locating their contact information, you may contact our friendly Travel Concierge at 1-844-868-7392. Depending on when the request is received, you may be eligible. Please review our change and cancellation policy.